1. "We're talking about things, but it's a very sad situation when I look in. We have incredible people, incredible fighters, but we'll see what happens, we'll see what happens." That is Trump's answer to the post question about the continued presence in Afghanistan. But in reality, it could be his response to virtually every conflict anywhere in the world. Or really any policy issue at all. Talk about things. Go see what's going on. I will see what happens. 2. "Let me leave the recording because I do not want to get involved with everything." When asked if he was going to do anything to help former campaign chairman, Paul Manafort, who allegedly signed an advocacy agreement with Robert Mueller's team only The States wanted nothing say for the record. Which is really interesting. After his unofficial answer to Manafort, the journalists of the post office ask to record it in one form or another. Trump replied, "I prefer not to, at some point I'll talk about it officially, but I prefer not to." Hmmmmmmmm! 3. "I see the Democrats are going to want to do something because they understand too, these pictures are very bad for the Democrats." Trump talks about his $ 5 billion request to finance the border wall. And I'm not sure where he relies on the fact that "the Democrats are going to want to do something," since all the Democrats I've seen recently have been extremely skeptical about Trump's proposed spending. for the wall. 4. "I know one thing: if she loses, I will be blamed and if she wins, we will not give her any credit, that's the only thing I know." The President of the United States always sees himself as a victim. In this case, he believes himself victim of a dishonest media that refuses to award him the merit of a Republican senator who wins by eight points in one of the most conservative state in the country. 5. "But finally, do you want to drink something?" One thing that people who have never had interaction with Trump does not understand, is how incredibly attentive he is, especially to the media. He wants to be perceived as a good guy and a clever one … It's almost as if all his rhetoric about "false news" was only a ploy to throw red meat at his based! 6. "One of the problems that many people like me – we have a very high level of intelligence, but we are not necessarily such believers." D & # 39; AGREEMENT. I have it. So, if you have "very high levels of intelligence," you do not believe in global warming? Someone should say more than 300 climatologists who participated in the fourth national climate assessment! 7. "You look at our air and our water, and it's now a clean record." First of all, "clean record". Second, we do not have "clean record". 8. "And when you talk about the atmosphere, the oceans are very small, and that breathes and it sails." This is not the onion. It's a real quote. On the point "the oceans are very small": the oceans cover about 70% of the surface of the Earth. 9. "It just sinks in the Pacific, it flows, and it says where it comes from, and it takes a lot of people to start." He talks about waste thrown into the oceans in Asia. I think. But I'm sure "it takes a lot of people to start." 10. "If you go back and you look at articles, they talked about the global freeze, they talked about one day when the planets could die of cold, so they will die from exhaustion due to the heat." Look. It is true that over the millennia, the climate has shifted both colder and warmer. But this is not the current problem of climate change. it is the speed with which the earth heats up and the deleterious impact of man on this process. Do yourself a favor and read this New York article by Bill McKibben on how climate change is already shrinking our planet. 11. "As to whether it is made by man or not, and if the effects you are talking about are there, I do not see it – not nearly as it is." The problem is that: Trump does not see it when it comes to human activity, the worsening of global warming is absolutely irrelevant. He should read the huge study that his administration has just published on all this! 12. "It's on fire, and they're raking it, working so hard, and they're raking it all in. If it's been raked in the beginning, there would be nothing to catch on fire." The theory of "rake" has been debunked. Many times. 13. "I'm not at all happy with the Fed, I'm not at all happy with my choice, I think we have to give up." Jerome Powell, call your office. In fact, maybe not. 14. "They make a mistake because I have an instinct, and my gut tells me sometimes that someone else's brain can never get me wrong." say." It's essential Trump here. He trusts his instinct more than the brain of a nerd. He values ​​his sense of the street more than just a bed in a book. Virtually every decision made by Trump can be explained by "my instinct tells me more sometimes that someone else's brain can never tell me". And no, I do not exaggerate. 15. "I'm not even happy with my selection of Jay [Powell for Federal Reserve Board chair]. Not even a little. " Mr. Powell, please take the red phone. At once. 16. "I do not blame anyone." Trump repeated this phrase throughout the interview, usually when he blames someone. 17. "It's a difficult part of the world – it's a dangerous part of the world – but they've been an excellent ally." Trump's double justification for not punishing Saudi Arabia for the murder of Washington Post reporter Jamal Khashoggi: 1) Listen, the locals in this area are constantly doing bad things, 2) They have been our ally. So here is. 18. "I know him, I know him well, crown prince." Trump's "gut" principle is very well exposed here. Although the CIA apparently concluded that Crown Prince Mohammed bin Salman had personally ordered the killing of Khashoggi, Trump refuses to tell because he knows MBS – and knows him well. 19. "I receive advice, I am the president of this country." 20. 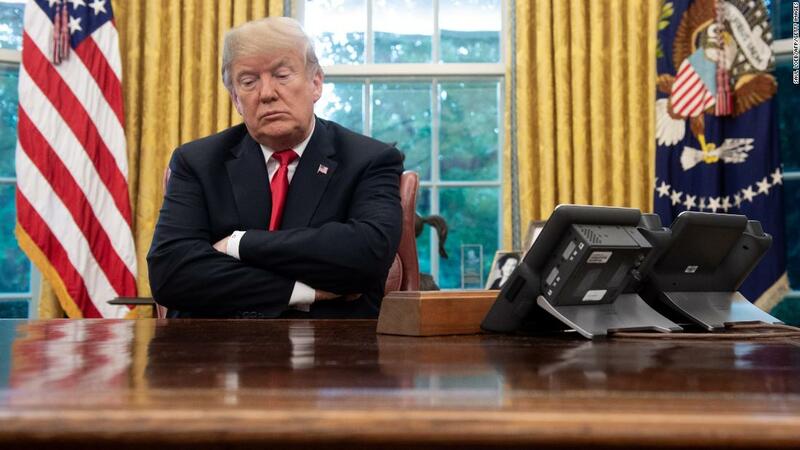 "So, I take everything into consideration, and again, he totally denies it, and he denied it to me on three different occasions, to three different calls, and many other people deny it. also." Trump uses the same logic to defend MBS as in the past to defend Russian President Vladimir Putin regarding Russia's interference in the 2016 election. It's as if Trump was unable to to understand that these foreign leaders may not tell him the whole truth for their own geopolitical reasons. Or he simply chooses to believe his "instinct" in relation to the "brain of someone else". 21. "It would not have to be, but it's still there, so I have no intention of doing anything." On Mueller, Trump does two things here: 1) makes it clear that he could get rid of special advice at all times (which it's not quite possible) and 2) strengthens the Idea that it does not have the current intention to take action against Mueller.